Valentine’s Day will be here soon, so naturally the thought of love is on everyone’s mind. But, so many questions need to be answered: What kind of flower should I send? What are some romantic ideas and gifts? Should I send a unique flower arrangement? Do I need a valentines gift idea? What phase of love are we at in our relationship? The answer to the first question is easy. You either love someone or you don’t. So with that question out of the way, what does question number two mean? Think about your life: it goes through stages and therefore, so does your love life. PUPPY LOVE is junior high school carefree and clueless love, with gestures that are low key and effortless. Puppy love doesn’t need elaborate romantic valentine ideas; just simple and fun. Sending a girlfriend or boyfriend a carnation in a bud vase or a fuzzy teddy bear is the perfect puppy love Valentines gift. YOUNG LOVE is high school sincere and public love. Valentine’s Day is the biggest day of the year for young love. A girlfriend or boyfriend in the young love phase wants outward displays of love and affection that are cute and fun. A balloon bouquet tied to a box of chocolates. A large unique balloon tied to a stuffed animal. A singing or animated stuffed animal. A teddy bear wrapped around a rose bud vase. Whether sending a balloon, stuffed animal or flower arrangement to your girlfriend or boyfriend, remember with young love it’s all about exposure. So, make sure your romantic Valentine’s gifts are delivered to school; in front of as many people as possible. TRUE LOVE is a genuine developing love. Romance is a must; not only at Valentine’s Day but all year long. True love wants grand romantic gestures and spontaneity. 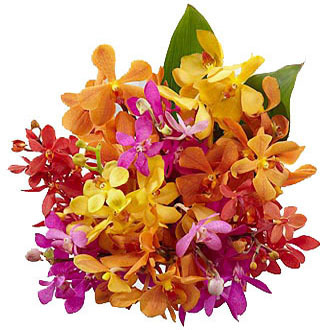 Flower arrangements are always a romantic gesture and paired with the unique or extravagant, just what the true lover desires. The fourteen days of Valentine’s Day (a different unique flower arrangement sent every day from February 1st thru February 14th). Chocolates in the shape of roses. 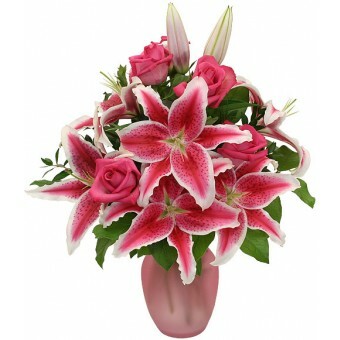 A beautiful flower arrangement with ‘Stargazer’ Lilies. Flower petals leading to his favorite game chair where beverages, snacks and a night of sports TV await him. A basket of treats sent to his office with the promise of a romantic adventure. A vase of roses with strategically placed theatre tickets or engagement ring. In True Love, it is all about romancing them, so make sure your romantic gift ideas are thoughtful and spontaneous. NEWLYWED LOVE is a committed and idealistic love. Life is one big romance with the ideal husband or wife. 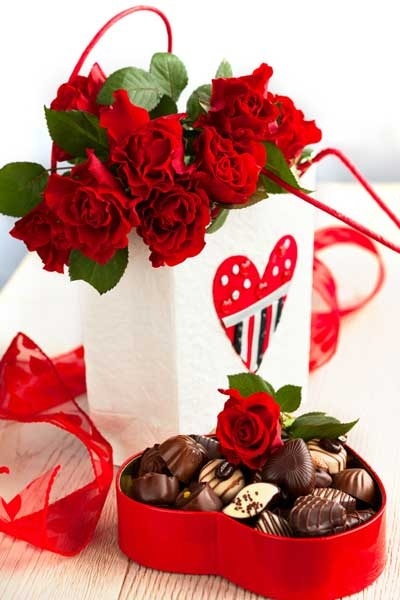 Sentimental and elegant are the essence of Valentine’s Day romantic ideas and gifts for Newlywed love. Send him a spa basket and a promise of a personal masseuse. A special picture of the two of you in a beautiful frame. 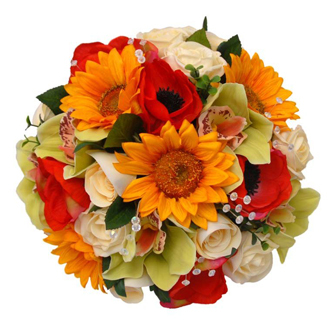 Send a flower arrangement that matches the bridal bouquet from your wedding. A single long-stemmed rose draped with a bracelet or necklace. A bouquet of her favorite flowers. An elegant keepsake box with fresh flowers. Every day for newlyweds is like Valentine’s Day, but it can be special with a little thought and planning. Remembering all the firsts in the relationship can give the newlywed love a creative way to be elegant and sentimental. A unique flower arrangement (containing a rose or special flower for every child). A spa gift basket containing foot massaging crèmes and a foot massage promise. A hobby basket with snacks and items relating to their favorite hobby. A bottle of wine and flower bouquet and an invitation to a night out. A bubble bath surrounded with aromatic candles and a plate of chocolates. Admiration is the key to everyday love. This love needs to show appreciation with romantic ideas and gifts, especially on Valentine’s Day. 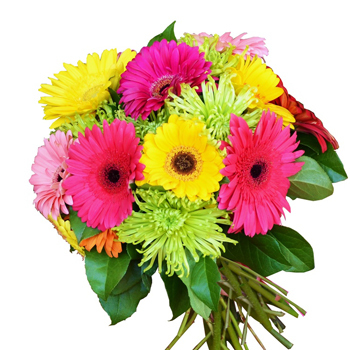 A single rose or gerbera daisy is the fundamental romantic gift. 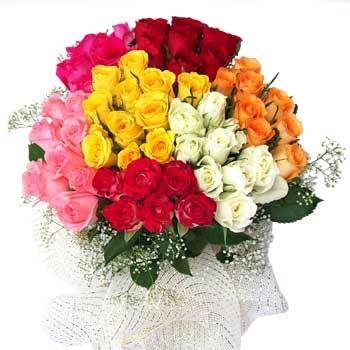 A unique flower arrangement can show appreciation. 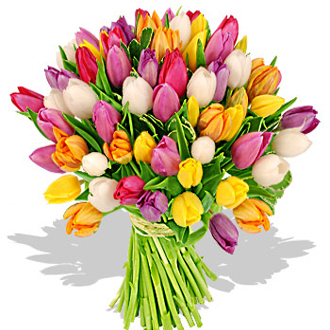 A funny balloon bouquet can bring joy. A sentimental gesture of any kind is always wonderful. Visiting the phases of love over and over with your wife or husband is the key to their happiness. With the Sweetest Love, there is always room for romance not only on Valentine’s Day but every day. Valentine’s is a great holiday with endless possibilities to show someone how much you love them. Have you answered the questions and are still struggling with romantic ideas? 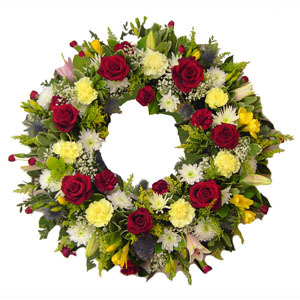 Contact your local professional florist; they are always willing to help.